Lectures on nervous diseases from the standpoint of cerebral and spinal localization, and the latter methods employed in the diagnosis and treatment of these affections. Philadelphia : F. A. Davis, 1888. Description : [i]-xiv p., [1 l.], 1-778 p., [1 l. pl.] ; ill.: collotype h.t., 2 in-text photos., engrvs., tbls., 15 pls. ; 24 cm. Photographs : 1 collotype leaf with 2 portraits, before and after. 2 in-text halftones. Subject : Nervous system — Diseases. Author caption: AMBROSE L. RANNEY, A.M., M.D., Professor of the Anatomy and Physiology of the Nervous System in the New York Post-Graduate Medical School and Hospital ; Professor of Nervous and Mental Diseases in the Medical Department of the University of Vermont ; Late Adjunct-Professor of Anatomy in the Medical Department of the University of the City of New York ; Member of the Neurological Society of New York ; Resident Fellow of the New York Academy of Medicine ; Member of the New York County Medical Society ; Author of " The Applied Anatomy of the Nervous System," "Practical Medical Anatomy," " Electricity in Medicine/" etc. Other printings, 1889, 1890, 1892. Title page content: PROFUSELY ILLUSTRATED WITH ORIGINAL DIAGRAMS AND SKETCHES IN COLOR BY THE AUTHOR; CAREFULLY SELECTED WOOD-CUTS, AND REPRODUCED PHOTOGRAPHS OF TYPICAL CASES. Half-tones are from W. E. Smith »». Index Medicus: 11110131030, 21104931070, 21402921060. It has been my custom for some years to have impressions from untouched photographic negatives made of many of my patients before any mode of treatment was commenced. I have found them very useful in many ways; and they certainly constitute the easiest and most reliable method of recording some medical facts. — Page 117. The results of this imperfect examination (necessarily so under such conditions) indicated to me that a high degree of hyperphoria existed ; and as I could not again see the patient for some months, I decided to perform a free but incomplete division of the left inferior rectus muscle. I then instructed the patient to try and get a photograph taken, if possible, before she saw me again. She laughingly said that she had never been able to have a picture taken, but she would do so if she could. She then departed for home with instructions to return to me for treatment in the autumn. The first picture received of this case was one that she was able to have taken three weeks after the operation, when her head and shoulders had become comparatively calm, as a result of the relief afforded by it. This photograph was deemed at that time a great success by herself and friends. You can see in it the blurred outlines which indicate that the movements were still somewhat active. During the past autumn this patient has been under my care for some eight weeks. I have partially divided the right superior rectus and both externi in order to overcome a high degree of left hyperphoria and exophoria, and I have administered static sparks daily to the spine and limbs. The second picture will give, better than words can describe it, an idea of the wonderful improvement which has taken place. — Pages 499-500. 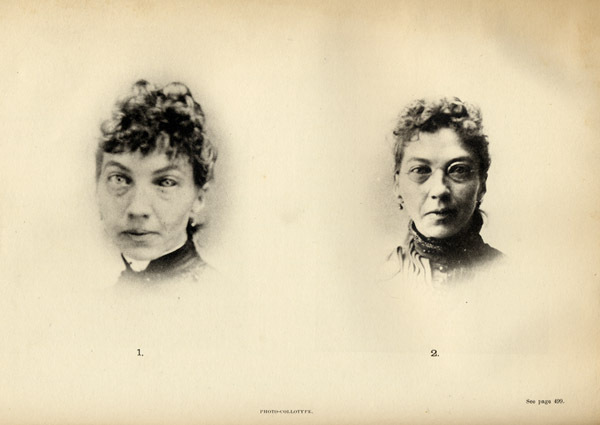 The collotype leaf is a portrait of chorea in a 33 year-old female patient, before and after ophthalmic surgery. Ranney was an entrepreneurial New York physician, well respected for his anatomical scholarship, but whose contributions to medical literature effectively communicated the scholarship of others. He frankly acknowledges these debts, particularly what he owed to his friend and dedicatee Dr. George T. Stevens whose published theories of eyestrain as a cause of functional nervous disorders he made his own – vide intra »». The section on degenerative ataxia with its two half-tone photographs was made possible by the research of Willard Everett Smith – vide intra »».